Challenging a longstanding debate that questions uterine fibroid embolization (UFE) as a treatment option for women who want to conceive, researchers from Portugal recently announced that the procedure not only does not compromise fertility but it also can restore it in selected patients. Such findings provide an additional reason for health care professionals to do what UFE pioneer James B. Spies, MD, MPH, FSIR, suggests they need to do more: include UFE in discussions about treatment options. "This [low awareness] is a problem," says Spies, a professor of radiology at MedStar Georgetown University Medical Center in Washington, D.C., who has been a principal investigator in five funded research trials, including the 3,000-woman Fibroid Registry for Outcomes Data, or FIBROID, study. According to Society of Interventional Radiology (SIR) President Suresh Vedantham, MD, FSIR, UFE has proven benefits over other treatment options, including those that are radiologic and surgical, for treating women diagnosed with symptomatic fibroids. Yet 44% of women say they have never heard of UFE, and 11% think hysterectomy is the only treatment option. "UFE is a minimally invasive, effective, nonoperative means of treating uterine fibroids, with excellent outcomes and a good safety profile," Spies says. For women with symptomatic fibroids, the procedure "avoids surgery, preserves the uterus, controls symptoms," and "improves quality of life," according to a SIR report, "The Fibroid Fix: What Women Need to Know." Research, according to the report, has proven UFE to be a less invasive and less painful option than more invasive treatments, such as hysterectomy and myomectomy, and to have a quicker recovery time and low rates of complications. Spies, who is featured in the report, adds that UFE is more effective than other treatments such as MR-guided focused ultrasound ablation, laparoscopic ultrasound-guided radiofrequency ablation, and transcervical ultrasound. "All these are therapies focused on one or two fibroids; in many women, they do not treat all the fibroids. They also are more limited in their ability to kill entire fibroids," Spies says. "Therefore, on average, they are applicable in fewer women, and it is likely that their long-term effectiveness is less than UFE." Regarding the findings of the research that looked into UFE and fertility, Tiago Bilhim, MD, PhD, EBIR, of the department of IR at Saint Louis Hospital in Lisbon, Portugal, says, "[Our] study shows that women can, in fact, undergo UFE, treat their symptoms, and still get pregnant and deliver live births. This study supports that UFE does not compromise future fertility and can, in fact, restore fertility in selected patients." For the study, the team followed 359 women with uterine fibroids who underwent conventional or partial UFE, according to research findings published in Radiology this past October. Of the group, 149 (41.5%) were able to get pregnant one or more times over the average follow-up time of about six years. A total of 150 babies were born to 131 of the women. "The women in this study were not able to conceive before UFE and after UFE gave birth to live children," Bilhim explains. "This technique allows women to undergo embolization of the uterine arteries to relieve their fibroid-related symptoms, such as abnormal uterine bleeding and pelvic pain, but, at the same time, preserving fertility." The study, led by João M. Pisco, MD, PhD, also from the department of IR at Saint Louis Hospital, is one of the largest cohort studies looking at UFE in patients wishing to conceive, Bilhim notes. "These findings are important because there is a large controversy on the role of UFE for women who wish to conceive. The study helps to increase the level of evidence that UFE may be advisable to treat fibroid-related symptoms in women who wish to conceive." UFE can be performed using a femoral approach or via the radial artery in the wrist. As far as any drawbacks to UFE, Vedantham says women may develop new fibroids. However, "Women who undergo myomectomy also may develop new fibroids," Spies explains. "There are infrequent complications, just as there are after any procedure. On balance, serious complications are less frequent with UFE, and it has a more rapid recovery than surgery." For women, whether interested or not in future pregnancies, the ACR deems uterine arterial embolization (UAE)—another name for UFE—and myomectomy "usually appropriate" for treating women diagnosed with fibroids, but states that further studies are needed. "Studies to date demonstrate that UAE should not be considered the first-line choice in women seeking pregnancy, and myomectomy should be offered as the first therapeutic choice," the ACR reports in its 2017 ACR Appropriateness Criteria. According to the ACR criteria, "Although myomectomy is seen as the standard option, there is no robust evidence, and studies need to be performed to investigate whether UFE is superior, inferior, or equal to myomectomy. There is very limited evidence that myomectomy may be superior to UAE in women planning future pregnancy, and higher-quality research is needed." The report notes that "UAE can still be considered in this subgroup of women in certain situations, such as those who are poor surgical candidates, those who have fibroids that are not surgically resectable, and in those who have had repeated myomectomies." Overall, Spies says, professionals, including those within radiology, should make sure to discuss more than just surgical options. "There is more data available on reproductive outcomes after myomectomy and weak evidence from one randomized trial suggesting somewhat better reproductive outcomes after myomectomy, so interventionalists commonly recommend consideration of myomectomy first in women seeking to become pregnant," he says. "UFE has many benefits and compares very favorably to surgery. Many women would like a hysterectomy or myomectomy to be the last choice and would like to try less invasive options first." To raise awareness about UFE, SIR launched a national campaign last August, which included the aforementioned SIR report. 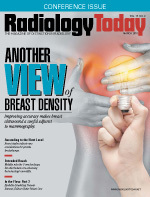 "The report incorporated findings from decades of IR research; a new, SIR-commissioned Harris Poll of women across the United States; and patient stories about their quests for treatment," explains Vedantham, a professor of radiology and surgery at the Mallinckrodt Institute of Radiology in St. Louis. "The report helped stimulate a national conversation about fibroid treatments aimed at bridging the awareness gap among women diagnosed with uterine fibroids." According to the results of the Harris Poll published in the SIR report, 32% of women first learn of UFE from friends and family, 27% learn of it from an OB/GYN, 23% from advertising, and 9% from their own research. Vedantham says the society continues to work with payers and health care providers to ensure that women have access to UFE. "This minimally invasive treatment has improved quality of life for women for more than 20 years," he says. "It is important for the patient to be provided with all the information to make an informed decision that takes into account her priorities and wishes," Spies says. "UFE is the best studied and validated alternative procedure for symptomatic fibroids, and every woman has a right to know about this option when considering therapy. Some women are not good candidates for surgery, and some women do not want surgery; therefore, the role of UFE in this patient group needs to be carefully considered and discussed with the patient to come to the best plan for that woman." — Jeannette Sabatini is a freelance writer based in Malvern, Pennsylvania.